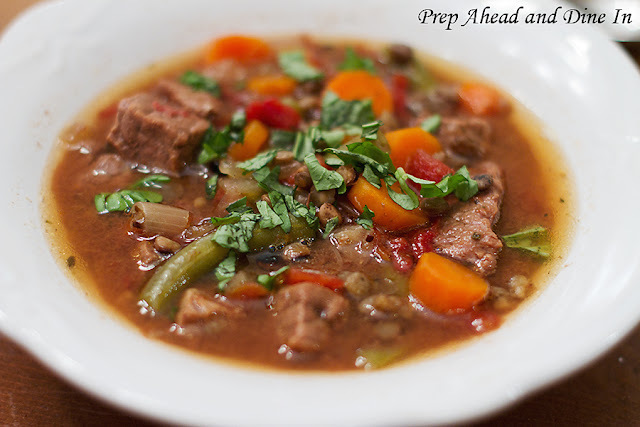 We were feeling a little guilty after indulging in the shrimp Alfredo dish over the weekend and I decided to plan some lighter menu items for the week including baked salmon, grilled chicken and this Italian beef and lentil stew I adapted from the Weight Watcher website. My adaptations included different vegetables and the addition of seasonings which do not alter the Points Plus Value for any counters out there! Prep Ahead Plan: Combine all ingredients except the basil and lentils in the slow cooker the night before. Refrigerate until ready to turn on! Before cooking, mix in the lentils. 1. Place all ingredients in the slow cooker except for the fresh basil. Cook on low for 6-7 hours. Stir in the basil during the last 5 minutes of cooking. We like to balance out our lighter side menus with this kind of weekend indulgence. 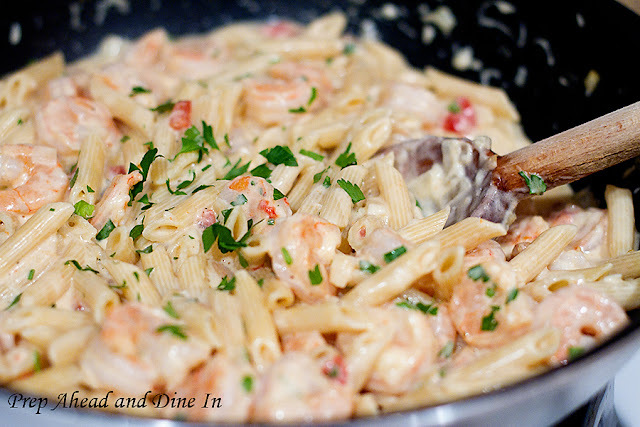 This shrimp dish comes together quickly and is perfect for entertaining! Doing a little bit of the prep work ahead of time limits the amount of time you need to spend in front of the stove. 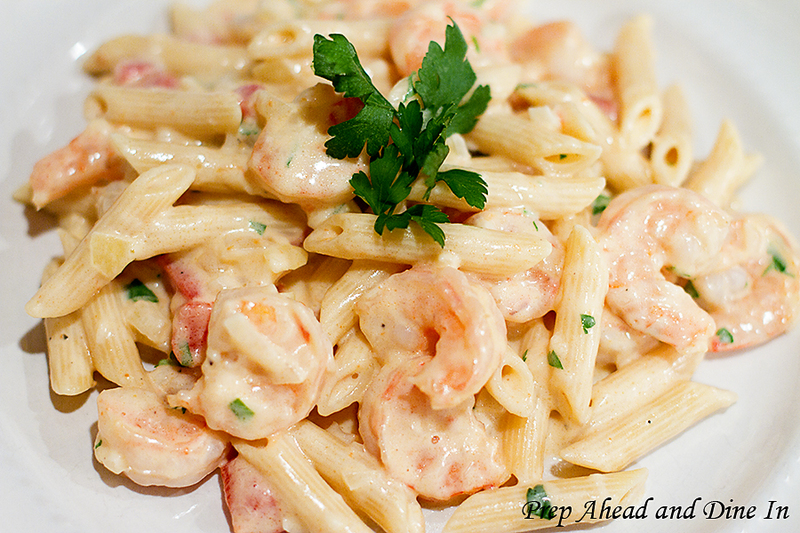 I used jarred Alfredo sauce but you could easily whip up your own and use that if you prefer! Prep Ahead Plan: Chop the onion, garlic and roasted red pepper ahead of time and store in a small container or Ziploc bag. I like to buy the EZ peel raw, deveined shrimp. Do the peeling ahead of time and store the raw shrimp in the fridge (in an air tight container) until ready to use. 2. Meanwhile, melt butter together with the olive oil in a saucepan over medium heat. Stir in onion and garlic. Cook until softened and translucent, about 2 minutes. 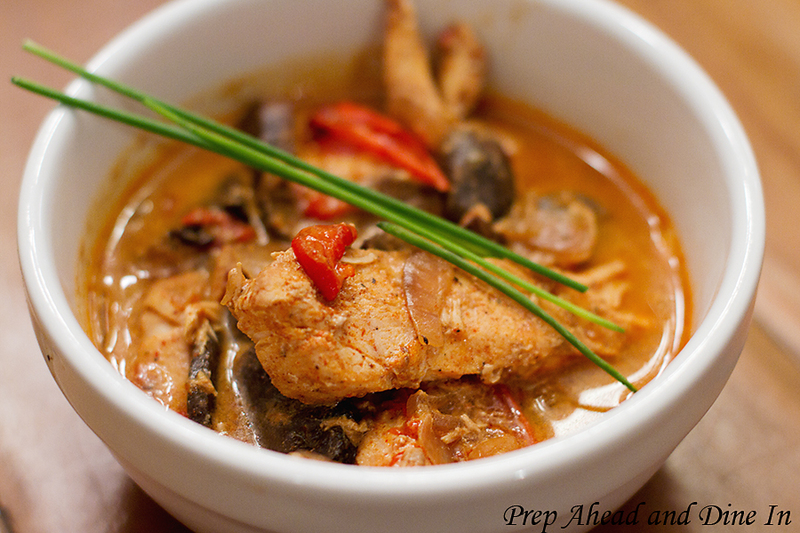 Stir in the roasted red pepper and continue to cook a few minutes more. 3. Stir in the shrimp, tossing around in the pot so it cooks evenly. Cook until firm and pink. 4. Add in the Alfredo sauce, Romano cheese, and cream. Cook over medium heat, stirring constantly until thickened (just a few minutes). Season with crushed red pepper, salt, and pepper to taste. Stir drained pasta into the sauce, and serve sprinkled with chopped parsley. I have been on a hunt for some new healthy recipes this month! I have found the Weight Watcher website to be a great resource for easy, family friendly well balanced dinners. This one was a hit last week. I adapted it slightly by using baby bellas and adding more paprika. The original recipe requires you to sauté the vegetables for 5 minutes which I did when I made it. I omitted it in this version because I really felt it was unnecessary! After our fattening Super Bowl menu today, I’m excited to try some of the other healthy dinners I bookmarked for this week! Prep Ahead Plan: Combine all ingredients except for flour, sour cream and chives the night before! Let it stay in the fridge until you’re ready to turn it on! 1. Combine all of the ingredients in the slow cooker EXCEPT for sour cream, flour and chives. 3. Mix together sour cream and flour and add to the pot. Stir and cook about 10 minutes more, until hot. Garnish with chives. Stir together flour and sour cream in a cup; stir into chicken mixture. (Note: We stir flour into the sour cream to prevent the cream from curdling in slow-cooked dishes.) Cover and cook on 3. Copyright © PrepAhead and Dine In: February 2012. All Rights Reserved.